The Scimitar of Smiting is a dangerous weapon. It does not have a bonus to either the to hit roll or damage, but it does grant one additional attack. The sword does count as +1 magical weapon for the purposes of striking targets immune to mundane weapons. On each successful melee strike, the blade begins to crackle with energy, slowly charging. If a natural 6 is rolled for damage, the sword is fully charged. On the very next round, the wielder can unleash a bolt of lightning for 1d6+1 points of damage. The holder will have this information transmitted to them as a vague instinct, no words, just the idea. Lightning blasts are so random, the user cannot add their Dexterity bonus for ranged attacks. The weapon can be used as a melee weapon or as a range weapon while it is charged. The weapon will fire lightning at the same rate as the users normal attacks, plus one. It can alternate between swings and bolts in any chosen pattern. The weapon will lose its charge if sheathed, touches the ground or if a miss is rolled. This means as long as the wielder strikes a target, they have another chance to strike another target. Swings and bolts can be targeted on the same or different creatures in the same round. Wiley characters may attempt to charge weapon by deliberately striking objects or the ground. This never works. The weapon will unleash an electrical burst on the holder for 1d6 hp damage if they state they are attempting this. There is no saving throw. If the holder contrives some situation where they cannot be shocked by this burst of energy, such as a spell, the scimitar will smite them later. The sword will wait until it is good and ready, rather the earliest opportunity. 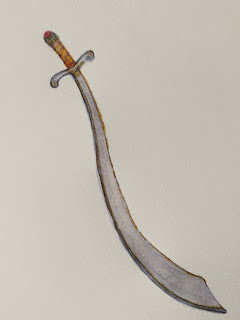 If the sword decides to wait, it will often select a time when the wielder is well away from others or when the strike would most deadly or embarrassing. For example, shocking a swimmer or when entering a church or temple. The delayed damage is 2d6, with no saving throw. The sword is vaguely intelligent, but does not speak or communicate often. Most communicated information is emotional in nature.